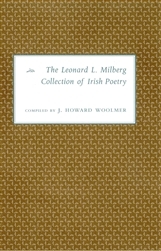 This catalog is a companion volume to The Leonard L. Milberg Collection of American Poetry, published by Princeton Univ. Library in 1994. The Milberg Collection of Irish Poetry started with eight or ten poets and has since grown to the point where the Library now collects all of the printed works of 50 poets from both the Irish Republic and the North. Each entry in this catalog lists the title, place, and date of publication, and publication price, when known. Some poets include: Samuel Beckett, Sara Berkeley, Padraic Colum, Seamus Heaney, Thomas Kinsella, Paul Muldoon, Denis O’Driscoll, Sean O Riordain, and Matthew Sweeney. Includes an Introduction by Wes Davis. Photos.